Doughnuts are super popular at the moment, I've seen doughnut wedding cakes and they've made a come back at parties as well. We'll just ignore the fact that they're pretty deadly in the calorie department and try not to have 17 at once. 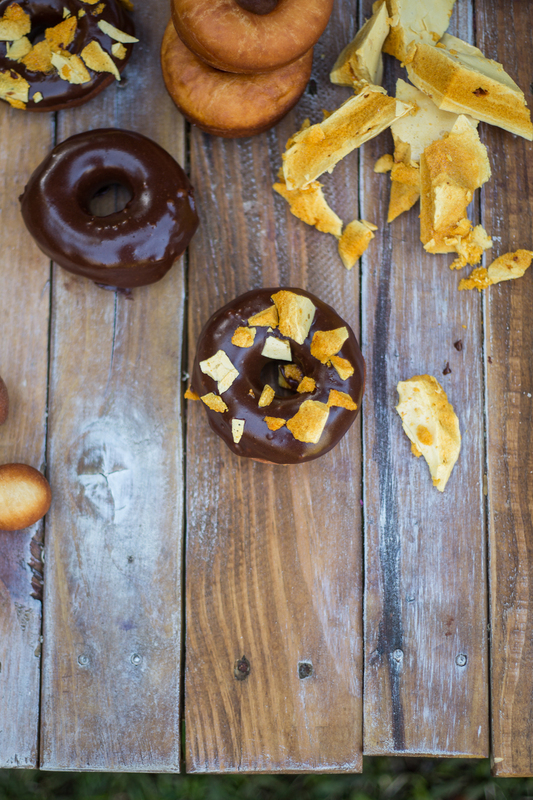 I've come up with some fancy pants doughnut ideas for those brave enough to make their own. By the way, it's definitely worth making your own, the mass produced ones just don't measure up. 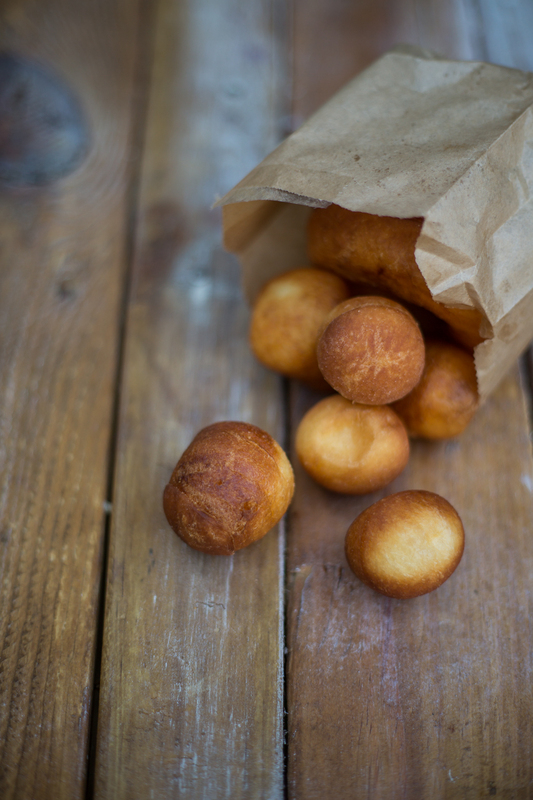 Here's a pretty spectacular recipe for brioche doughnuts which I've diligently copied from the amazing Humming Bird High blog which can be found over here. I've made a couple of tweaks but they're pretty minor and mostly involve the spelling of the word "doughnut". Below the dough recipe are three different topping options I've come up with. In the bowl of an electric mixer fitted with a paddle attachment, combine the water, active dry yeast, whisked eggs, honey and melted unsalted butter. Sprinkle 7 1/2 cups all-purpose flour and the salt over the wet ingredients, before turning the mixer on to its lowest speed and mixing in the flour until just combined. If your dough is still very wet add the last 1/2 cup of flour. You may notice lumps in the dough, but don’t worry — these will disappear in the finished product. Cover the bowl loosely with a flour cloth or a plastic wrap and allow the dough to rest at room temperature for 2 hours, before kneading down and covering very tightly with plastic wrap and refrigerating. The dough can be used as soon as it’s thoroughly chilled, at least 3 hours. You can refrigerate the dough for up to 5 days. The dough will keep for up to 2 weeks in the freezer. When using frozen dough, thaw in the refrigerator for 24 hours before using, before allowing the usual rest and rise times. On frying day, dust the surface of the refrigerated dough with flour, divide into quarters and work with one quarter at a time. Roll the dough into a 2cm thick rectangle on a lightly floured surface. Using a doughnut cutter, stamp out your doughnuts. If you don’t have a doughnut cutter use a large glass for the body of the doughnut and the large end of a piping tip to cut the doughnut hole. Allow the dough to rest on a warm, lightly floured surface for 20 minutes. Meanwhile, fill your deep-fryer or cast iron skillet with at least 12cm inches of oil. Heat the oil and drop a doughnut hole into the oil. As soon as the oil starts bubbling around your doughnut hole and it starts turning brown your oil is ready. Carefully drop your stamped doughnuts into the hot oil, two or three at a time depending on the size of your cast iron skillet. Be sure to leave plenty of room for the doughnuts to float to the surface. Do not overcrowd, or they will not rise nicely. Fry for 1 to 2 minutes per side, or until light golden brown. Remove with a slotted spoon, draining the doughnuts on a plate lined with a paper towel, and let cool slightly before glazing. In a medium bowl, whisk together powdered sugar and cocoa powder. Slowly stir in milk and vanilla extract. Add melted chocolate and whisk until silky and smooth. If you need a touch more milk to make this a dip-able glaze, add a bit more. 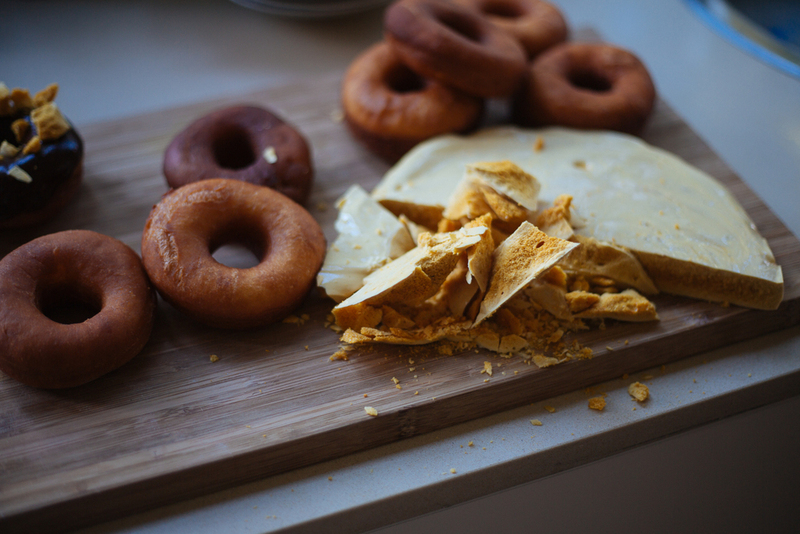 Dip doughnuts in chocolate glaze, sprinkle with honeycomb (see below) and let rest to harden slightly. Grease and line an oven tray with baking paper. Combine sugar, honey, water and golden syrup in a medium saucepan. Place over low heat and cook, stirring, occasionally brushing down side of the pan and spoon with a pastry brush dipped in water to remove any sugar crystals, for 5-7 minutes or until sugar dissolves. Increase heat to high and bring to the boil. Cook, without stirring, for 5-7 minutes or until the syrup reaches crack stage (154°C) on a sugar thermometer. Remove from heat and set aside for bubbles to subside. Add the bicarbonate of soda and quickly stir with a wooden spoon until combined (mixture will bubble and foam). Pour onto the tray and set aside to cool completely. Place the chocolate in a heatproof bowl over a saucepan of simmering water. Stir occasionally with a metal spoon until chocolate melts and is smooth. Transfer to a small plastic bag. Use scissors to snip off a corner of the bag. Turn the honeycomb onto a clean surface. Break into pieces. 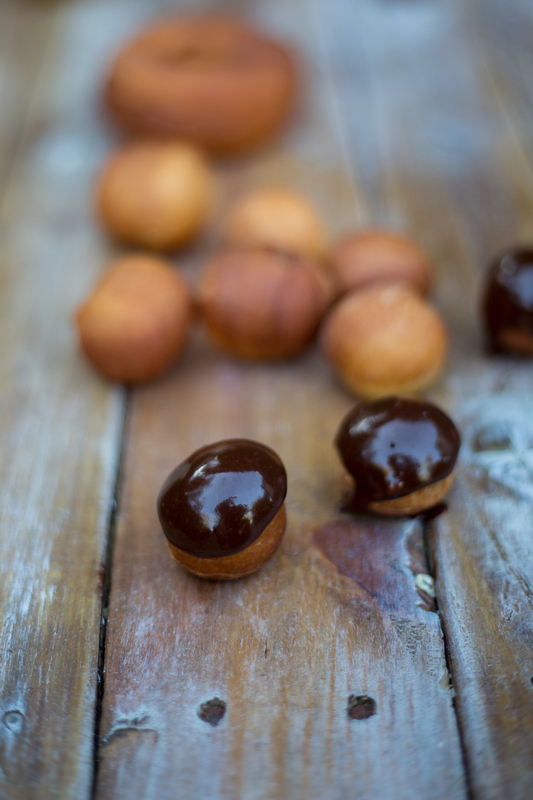 Scatter over chocolate dipped doughnuts. Place the powdered sugar in a medium bowl. Slowly stir in the rosewater until the glaze reaches a dip-able consistency but isn’t too runny. Toast coconut under a grill until slightly golden. 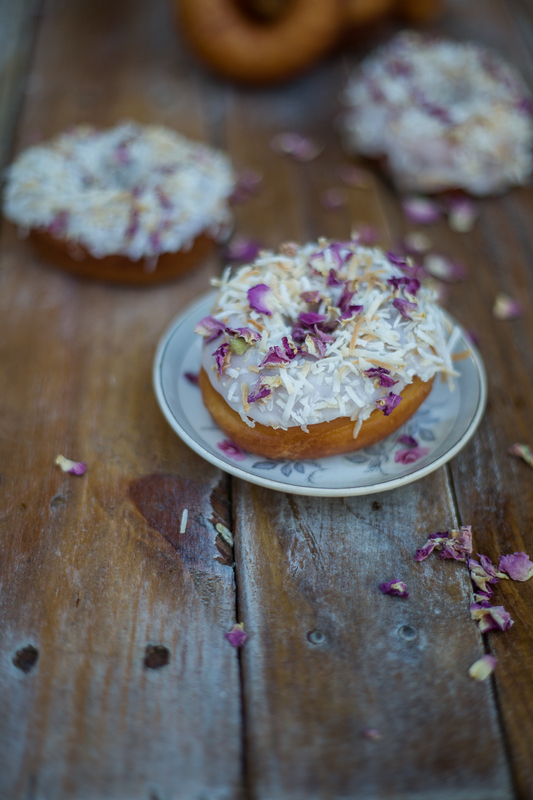 Dip doughnuts in rosewater glaze, scatter the toasted coconut and rose petals over the doughnuts.